I’ve been keeping to my Me-Made May ’12 pledge (at least two handmade items worn each week), but I was slammed by a week-long cold/flu/ear infection and then a second week of frantically trying to catch up on work and on sewing. I’ve only just regained the mental clarity and time required to write a blog post. May 1: Floral tunic (Simplicity 2262) w/ jeans and a gently-used apple green corduroy blazer (Theory, shown in May 19 photo below) that I picked up at Goodbyes, a SF consignment store. 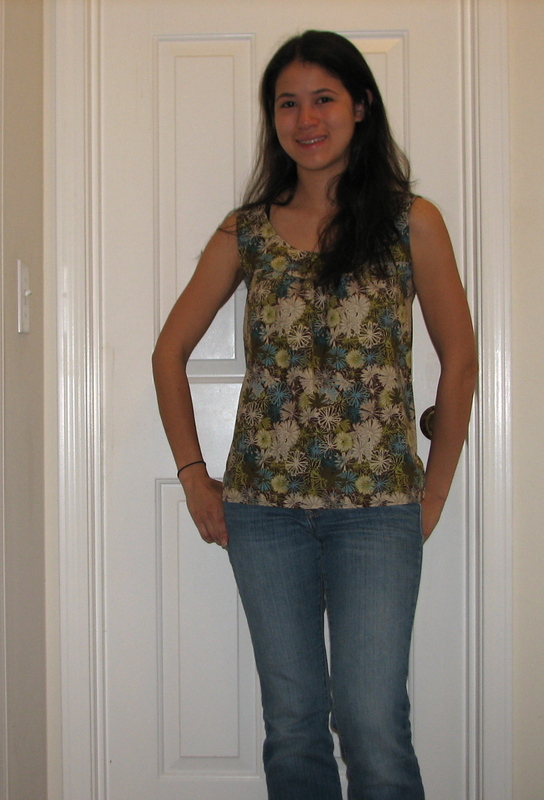 I made this tunic last year out of a baby bolt of cotton quilting fabric, so the fabric does not drape well. Colorwise, it fits with my default palette: Greens, Blues, and Browns (& grays)…what I like to refer to as my PNW palette. I made it when I was still figuring out commercial pattern sizes, so I had to elmininate at least 2 inches on each side seam, then it shrank (apparently I forgot to prewash the fabric) and now I feel happier with it. It was the only clean me-made garment on the morning of May 1. May 3: I still hadn’t done laundry, so I wore a hand-knit scarf (yes a warm scarf) all day because it was rainy and cold (thank you, Seattle). 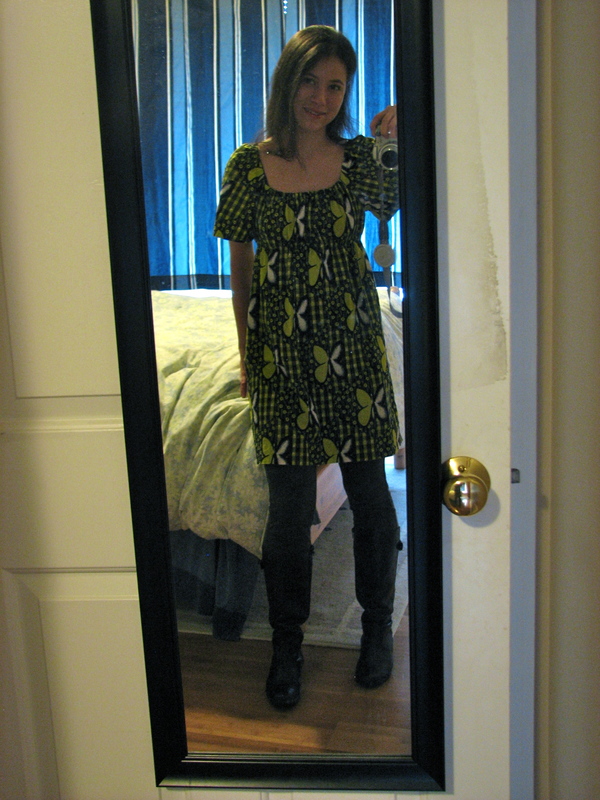 May 8: This butterfly dress (worn over leggings and boots) is one of the first garments I made in late high school. I used one of my mom’s sewing patterns from the 1960s. The fabric was allegedly brought back from India as a gift for my grandma, and then given to my mom who gave it to me. I still have some in my stash. I love the butterflies, and its brightness, but it really doesn’t go with ANYTHING in my wardrobe. It never has. 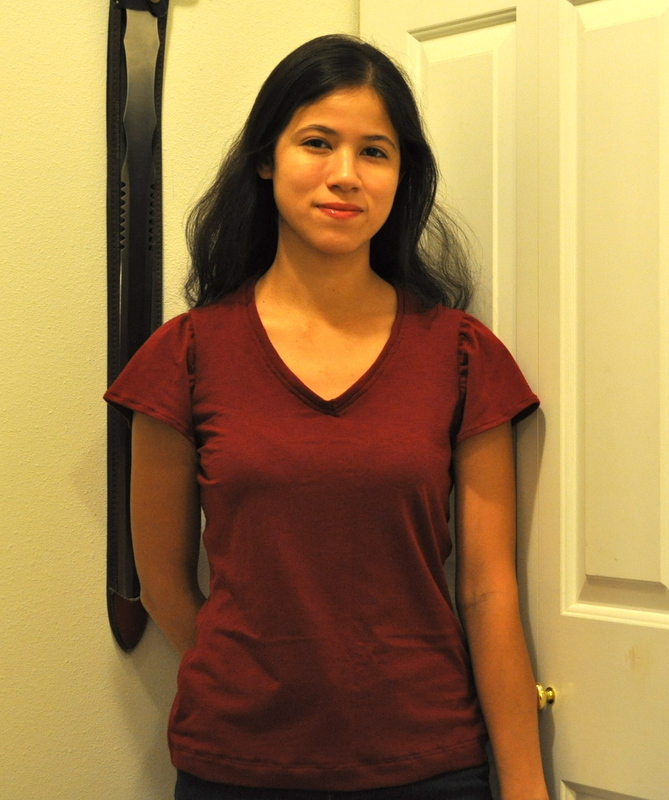 I am thinking about altering it: cut back the sleeves, move the elastic lower so it is at my natural waist. This baby doll dress makes me look too young. May 12: Hooray for doing laundry. I wore my maroon knit shirt (Simplicity 2261, blogged about here) with khakis for a day’s adventure on the Seattle Waterfront. I ended the evening at the Seattle Sounders soccer game and discovered I had inadvertently worn the colors of opposing team (Real Salt Lake City). Next time I need to do some pre-game research. May 13: Hooray for warm weather! While I was sick, I finished turning a gray pair of jersey gaucho pants into a skirt. I resewed the inseams and cut off 4 inches from the hem. I ended up wearing this skirt multiple times this week (at work and at home) because it was so comfortable. May 19: I finished my gray bedsheet, button up pintuck blouse in time for my mom’s visit to Seattle. This New Look Pattern 6104 is available in sizes 10-22, so it was a little loose around the neck line. I may need to learn how to grade down patterns for future uses of the pattern. Even though the sleeves have some pleats, they fit well under a cardigan. I used buttons from my grandma’s collection. And now I am out of completed Me-Made garments. I do have four pieces in progress, hopefully I can finish them before the month ends.